Do you like food? Not just eating it, but also trying new recipes and reading about it? Then a food blog might be right up your alley. 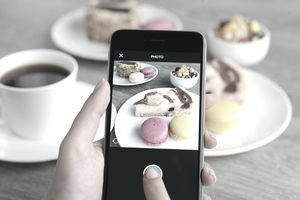 Food blogs are popular and easy to monetize. But like all other work-at-home options, it takes planning, follow-through, and persistence to be successful. Weighing the pros and cons of having your own food blog may just be the first step that helps you get started. Turn your enjoyment of food into income. Be creative with your food creations. Enjoy the ease and affordability of getting started. Take advantage of monetizing through ads, affiliate programs, and sponsorships. Build a community around food and eating. Look for other opportunities such as books, or even a chance at a cooking show like Ree Drummond, The Pioneer Woman. Your blog will need new content often to be successful, which means a lot of cooking and coming up with new ideas. You need to be able to take great photographs of your cooking process and results. It can take time for your blog to build up a readership that leads to a good income. Before you cook your first dish or start to photograph food, it's worth taking some time to conceptualize a few ideas around which you can plan your blog. Also, don't forget that blogging is a genuine business, so take care of legal matters such as business permits and self-employment taxes. Following are nine key tips to getting starting and making money from a food blog. 1. Decide What Type of Food Blog You Want to Start: Niches always do better than general topics, even when it comes to food. Niches to consider are gluten, carb or sugar-free, vegan, or frugal cooking. Or you can specialize in a type of food such as chocolate or side-dishes. 2. Create a Blog Name: Choose a name that describes your blog and is available as a domain name. When coming up with your name, be descriptive, but not too limiting that you can’t expand on your idea. For example, a chocolate candy blog might be too narrow, so instead you might want to have a name that would include chocolate cookies and cakes, and even meals (i.e., mole sauce). When it comes time to actually create the blog online, you can do all of the steps yourself or hire some help. Many online freelance work sites, such as Upwork.com and Fiverr.com, have workers that can set up many of the necessary components to create your blog's online presence. 3. Purchase Your Domain Name and Web Hosting: You can create a blog on free sources such as Blogger or Weebly, but the most successful (and profitable) bloggers, have their own hosting. Many web-hosts will include the purchase of your domain name when signing up for service. Or you can buy them separately. Choose a web host that offers easy WordPress install. There are other content management platforms, but WordPress is the most-used and one of the easiest to learn. 4. Install WordPress on Your Web Hosting Account: Check with your host provider on how you can do this from within your hosting account. Once installed, choose a theme that works well with food. From within your WordPress dashboard, you can search “food” themes and click to install. For best results, choose a theme that is responsive (adjusts for easy reading on tablets and smartphones), optimized for search engines, and is easy for readers to navigate. You can get themes for free, but you might want to consider purchasing a theme for greater customization and features. 5. Install Plugins to Maximize the Site: The basic plugins you should install include Askimet for comment spam filtering, social media tools so people can share your content, caching to make your site load faster and be less of a drain on your host, contact form (don’t put your email address on your blog or you’ll get spam), and Google Analytics. Also, consider adding foodie plugins such as EasyRecipe, which makes it easy to enter and print recipes, as well as optimizes your recipes for Google. 6. Set up an Email List: Email lists will help you generate more income. You can email your list to let it know about new recipes, and reminding people to return to your site so they can then click on your monetization options. You can also email special offers and promotions. Use an email service and paste a sign-up form on your blog. Offer a freebie such as recipes or cooking videos to entice visitors to subscribe. 7. Add Recipes: You should add 10 to 15 recipes right away, so readers have several to read. After that, create a blogging schedule to add several recipes a week. When you add your recipes, take appetizing photos and write clear step-by-step instructions. Don’t be afraid to add personalized information such as changes you made to the recipe or stories about the recipe’s history (i.e. If it’s grandma’s recipe). These last two tips have to do with attracting readers to your blog and growing your traffic so that you can start generating some real income. Setting up social media accounts such as Pinterest, Facebook, and Twitter to share your recipes. Making videos that you can post on your blog, but also publish on YouTube. There are many low-cost and free ways to market your blog. Don’t forget to consider offline marketing strategies as well. Affiliate programs, such as promoting cooking tools through Amazon's Associate's program.